You may have an application that involves keeping boxes on a conveyor belt or maybe you want to seal an opening in a door or machine. There are different names for brushes that would be best for your particular application depending on the exact requirements or the environment where the brush will be used, but many people are initially looking for what they would refer to as a straight brush. We would define a straight brush as a linear brush that has filaments in a line with a width at the base of no more than about ½ inch. There are many choices in regards to brush width and many styles of brush to choose from, but the most popular and versatile of this style is a metal channel brush. This type of brush consists of natural or synthetic bristles held securely in place by a U-shaped metal backing and center wire. There may be occasions that necessitate spacing between the filaments. Perhaps your application calls for a very light brushing action, or requires that materials or light go through the brush. In these instances, a staple set style could be your best choice. Filaments can be placed exactly where you need them along the straight brush to accomplish your brushing needs since each grouping, or tuft, of filament is set into a hole that is placed and drilled to your requirements. 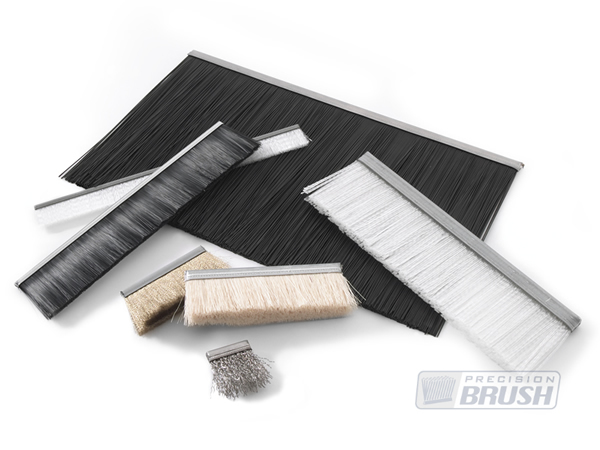 Flexible backed brushes are used when a flexible, or bendable, brush backing is a priority. Not only are the filaments flexible, but so is the backing that holds the bristles. These flexible brushes are especially helpful when there is more than a one directional curve desired in a brush - for instance, holding paper as it goes through a printing press or sealing odd shaped openings in machinery. 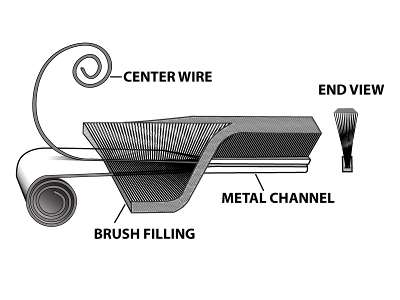 In general, metal channel brushes are what people envision when they think of straight brushes, but there are many options to solve your brushing requirements. Precision Brush specializes in meeting your custom straight strip brush needs, and you can design your own brush online. You may also choose from our many stock options.